Would have rated this a 5 if there wasn’t the overbooking issue. Booking these villas may not necessarily mean you’ll be staying here. We made a booking back in June, a little concerned because of the reviews concerning the double booking issues. But thinking they would of surely sorted this problem out by the time we arrived in October, we booked. But we were wrong. The day before check in we were notified telling us our room had been double booked and would be put up at a sister villa just down the road. I think this may be one of two things. Either very incompetent management since we have stayed in at least fourteen other hotels and villas over the years and never had this problem before. Or a grab for extra bucks. When we booked it was at a very low rate. Ok that’s all the bad stuff. They arranged pick up from our previous villa in canngu to one of their sister villas “The Aya Villas” which we absolutely loved and wouldn’t have been disappointed staying there for the rest of our trip. Older style but huge villa. They also provided breakfast, which we did not order when booking. From there, they picked us and took us to Heliconia villas and upgraded us to a deluxe villa.which we also loved. Decent sized villa, clean and bright. Large pool clean and warm. Very friendly staff and not intrusive....Would have rated this a 5 if there wasn’t the overbooking issue. Booking these villas may not necessarily mean you’ll be staying here. We made a booking back in June, a little concerned because of the reviews concerning the double booking issues. But thinking they would of surely sorted this problem out by the time we arrived in October, we booked. But we were wrong. The day before check in we were notified telling us our room had been double booked and would be put up at a sister villa just down the road. I think this may be one of two things. Either very incompetent management since we have stayed in at least fourteen other hotels and villas over the years and never had this problem before. Or a grab for extra bucks. When we booked it was at a very low rate. Ok that’s all the bad stuff. They arranged pick up from our previous villa in canngu to one of their sister villas “The Aya Villas” which we absolutely loved and wouldn’t have been disappointed staying there for the rest of our trip. Older style but huge villa. They also provided breakfast, which we did not order when booking. From there, they picked us and took us to Heliconia villas and upgraded us to a deluxe villa.which we also loved. Decent sized villa, clean and bright. Large pool clean and warm. Very friendly staff and not intrusive. The villa is in a perfect location right on eat street but very quiet. the day before we were due to check in I received an email saying they had an error with their system and there was no longer a room available for us on the first night. to accommodate this mistake we were told we had to stay at another villa, approx. 150 m away and that and our next 4 days in the villa we had purchased would be in the upgraded room and with a free ride to the airport. this really annoyed me mainly because we had booked the room approx. 5 months prior and when we checked on all travel sites you were still able to book our room that they apparently didn't have. whilst we were allowed a refund if we wanted one by the time we had found out, a day before, there really wasn't much left on offer in the area we wanted at an affordable price. that said, once we eventually got our room at this place it was lovely and the staff were very friendly. it's cheap but cheerful and you get what you pay for. my advice might be though to email them before you get there to make sure the room is definitely available so that this doesn't happen to you. 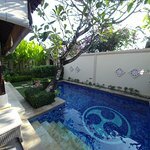 We stayed in the "Deluxe One-Bedroom Villa with Private Pool". First off, the villa and grounds were very clean and well taken care of. The 24 hour security made us feel safe and was always ready to greet us with a pleasant hi as we came to and from the villa. The staff were very attentive and housekeeping staff always made up the room after soon after we left each day. Little touches like lighting up the mosquito coil ready for our evening return is appreciated. Special compliments to Tirtawati who we had constant communication prior to our arrival and helped answer and arrange items as we needed. Tirtawati was able to help arrange a pool fence to be installed (at additional cost) as we requested for the safety of our toddler son. 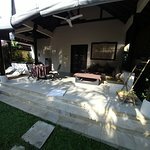 The villa is located a convenient short walking distance to many nearby restaurants and the local Coco supermarket which was great. As the accomation isn't directly on the road the villa was very quiet at night. As the lobby is located up a short driveway, the villas end up not being close to the main road or other restaurants and bars. I would highly recommend this anyone considering to stay here. Reading the reviews I made contact with the Villa via email before our stay. All booked and confirmed including transfers. 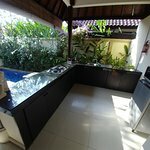 Villa is in a perfect location close to great restaurants Chandi was the best for lunch. Villa is clean, good pool, comfy bed, quiet, breakfast ok. We stayed in a two bedroom villa but only had access to one room. Would recommend. We were booked here for 8 nights through Expedia, when we arrived were informed Expedia had cancelled our booking even though we had confirmation of the booking. The staff here were amazing giving us the best villa for two nights for a 1 bedroom price, arranged lovely alternate accommodation for 3 nights and then back to Heleconia for two nights. They paid for transport between villas, breakfast and transport to airport, would definitely stay here again. Firstly - I have not stayed here, my review is not about the quality of accommodation or service. This review is about the TERRIBLE BOOKING HISTORY as evident in the reviews. I booked this property through a major package deal company - received confirmation and had had my payment taken. I read the first 2 to 3 reviews pre-booking and was very confident that Heliconia would be ideal. I quickly booked, the offer was great value. I then read further reviews and noted a pattern of double booking, people turning up to NO booking yet they had received confirmation and people having no option but to accept the alternate accommodation. So I emailed the Villa - a quick response of 'you have no booking'. I contacted my booking agent and after 5 days of promises to call back, attempts to extract further funds and offers of accommodation away from our carefully selected location I have been relocated to a beautiful Villa - with a certified booking. And as a side note - despite this all happening to me, the issues of no availability I raised - the villa is still at the time I write this stating availability on the booking website and multiple others. To those that do arrive to an actual booking I wish you a wonderful stay and to those who are reading this now - ALWAYS cross every T and dot every I.